This is a lovely salad we enjoyed today. It’s sweet and crunchy and looks lovely. We will have this more often over the rest of the fall and winter. If mangoes are not available, tangerines or the small mandarin oranges would also be nice with this. Peel the rutabaga and cut into matchstick shapes. Bring a sauce pan full of lightly salted water to boil. Add the rutabaga and cook 3-5 minutes until al dente (soft, yet still crunchy). When the rutabaga is ready, remove from the heat and plunge into icy cold water to stop the cooking process. Drain in a colander and then place in a large bowl. Slice the spring onions slightly on an angle. Add most of the spring onions to the rutabaga, reserving a few as garnish. To mix the dressing: place the lemon juice, white balsamic vinegar, olive oil and walnut oil in a bowl and whisk to blend. Add the salt and pepper and the agave syrup. Pour the dressing over the rutabaga and spring onions and allow to marinate in the fridge for 1/2 an hour or longer. Toast the pumpkin seeds in a dry frying pan until the begin to pop. Make sure you stir them so they do not burn. Remove from the heat when most have toasted. Place in a small bowl for later. Shortly before serving, peel and cut the mangoes. Add the mango pieces to the marinating rutabaga and gently mix. Wash and chop the basil. Add most of the basil to the salad and mix, reserving a few basil leaves as garnish. Cut the vegan non-dairy cheese into small cubes. Serve the salad on individual plates or bowls. Sprinkle a few pumpkin seeds and a few pieces of the spring onions on each plate. Place some cheese cubes on top of the salad and a few small basil, leaves. 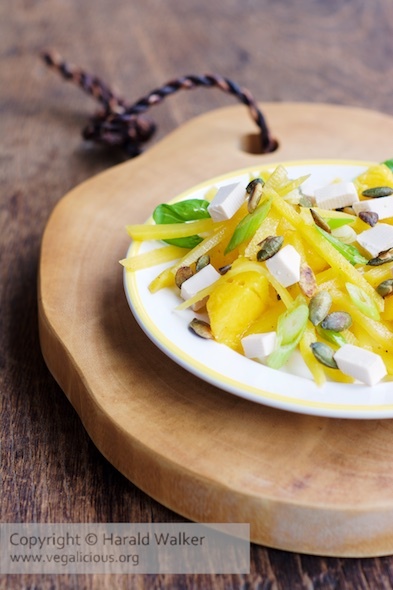 Posted by Chris Walker on November 19, 2014 in Mango, rutabaga, Salads, Soy cheese.